How does God make us right with himself? This is called the Gospel, and there are three points. “If you openly declare that Jesus is Lord and believe in your heart that God raised him from the dead, you will be saved. For it is by believing in your heart that you are made right with God, and it is by openly declaring your faith that you are saved” (Romans 10:9-10 NLT). 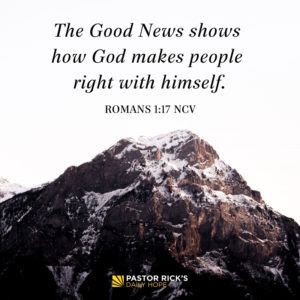 The Bible says in Romans 1:17, “The Good News shows how God makes people right with himself” (NCV). First, we can’t make ourselves righteous. Heaven is a perfect place. There’s no sin, sadness, evil, or injustice. But here’s the problem: We are imperfect, and God can’t let sinful people into heaven because then it would be full of sin, too. Romans 3:20 says, “No one can ever be made right with God by doing what the law commands. 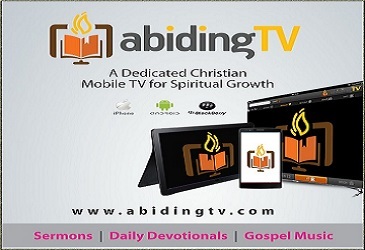 The law simply shows us how sinful we are” (NLT). The only people who think they can keep God’s laws are those that don’t know them, because God’s laws are perfect, and none of us are perfect. We cannot be made right on our own. So God had to come up with a plan. Second, God sent Jesus to pay for our sins so we could be declared righteous. Do you understand why the Gospel is called Good News? It means everything you’ve ever done or will ever do wrong in life has already been paid for by Jesus Christ on the cross. You have been made right with God. “[God] saved us, not because of righteous things we had done, but because of his mercy” (Titus 3:5 NLT). Third, we have to accept by faith what God did for us. To be made right with God, just believe and accept by faith that what Jesus did on the cross paid for your sins. Then, you are a part of God’s family. You can live the way he wants you to live now and then go to heaven in eternity. That is righteousness. Romans 10:9-10 says, “If you openly declare that Jesus is Lord and believe in your heart that God raised him from the dead, you will be saved. For it is by believing in your heart that you are made right with God, and it is by openly declaring your faith that you are saved” (NLT). God offers the gift of forgiveness through Jesus Christ to everyone—no matter who we are, what we’ve done, or how long we’ve done it.